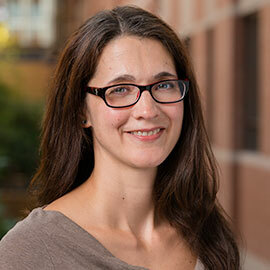 For the last 10 months, Wilfrid Laurier University Psychology Professor Anne Wilson has been a member of a distinguished national panel of experts working on a major review of the way the federal government funds fundamental science. On April 10, the panel, which also includes a Nobel laureate, Quebec’s chief scientist, two former university presidents, and well-known Waterloo philanthropist Mike Lazaridis, released its final report. According to the panel’s report, “by various measures, Canada’s research competitiveness has eroded in recent years when compared with international peers.” The report points to flatlined federal research spending as one of the causes. The report also recommends legislation to create an independent National Advisory Council on Research and Innovation to “provide broad oversight of the federal research and innovation ecosystem.” This council would, among other things, provide advice to the Prime Minister and Cabinet on federal spending as well as research and innovation priorities. "Over the past decade or so, proportionally more funding has gone toward priority-driven and industry-partnered projects. Although these initiatives are valuable, if they come at the expense of fundamental research it can constrain the capacity for new discoveries." Minister of Science Kirsty Duncan launched the Advisory Panel for the Review of Federal Support for Fundamental Science in June 2016. Its objective was to ensure Canada’s research remains and becomes increasingly world-class, delivering maximum benefits both to the research community and to ordinary Canadians. The aim was to understand where federal science funding is working well – and where there are gaps. It also considered if other countries have models that could address some of those gaps. The panel reviewed a wide range of topics including the structures of granting councils and review processes, whether emerging researchers of diverse backgrounds are facing barriers, whether different elements of funding are appropriately balanced, and whether granting programs adequately accommodate international, multidisciplinary and collaborative research. As part of its review, the panel consulted widely with the research community nationwide, including universities, colleges, individual researchers, industry and civil society, as well as with the general public. There were a dozen round-table discussions with 230 researchers in five cities, focusing on different aspects of that community – early-career researchers, more senior researchers, international researchers, community researchers, Indigenous researchers and researchers with expertise in diversity issues, said Wilson. In addition, the panel reviewed 1,275 online submissions. The panel’s recommendations include improving the system of research funding governance so there is more consistency and communication between funding bodies. The report also calls for increasing funding in certain areas. The panel was an independent and non-partisan body and its recommendations to the Minister of Science are non-binding, but Wilson hopes the federal government will make it a priority to increase funding for fundamental research. “Over the past decade or so, proportionally more funding has gone toward priority-driven and industry-partnered projects. Although these initiatives are valuable, if they come at the expense of fundamental research it can constrain the capacity for new discoveries,” said Wilson. Participating in the panel was “a really great experience” but also “an incredible amount of work,” said Wilson, who worked on the panel while fulfilling her full-time job as a professor, a Canada Research Chair in Social Psychology, a Fellow of the Canadian Institute for Advanced Research Successful Societies program, and a member of the College of New Scholars, Artists, and Scientists at the Royal Society of Canada. Mike Lazaridis, co-founder of Waterloo-based Quantum Valley Investments and founder of the Lazaridis Institute for the Management of Technology Enterprises, based at Wilfrid Laurier University's Waterloo campus. Martha Piper, former president, University of British Columbia.